So I thought if I could place the family of her grandmother (EM) near or around the suspected grandfather’s family (JG), there may be some evidence that my JG was indeed her grandfather. So I sent these details off and she responded that there was a family rumor about her grandmother being ‘a mistress’ (there’s usually some truth to those family rumors) and that she looked at the 4 daughters of JG from 1940 and one of them popped up on her DNA matches as a second cousin! Confirmation and mystery solved? She contacted this second cousin and it was confirmed that JG was their common grandfather so she is hoping to get to know her new relatives and see pictures of her half-Aunts and cousins. Her great grandmother and my great grandmother were sisters, so we are more distant, but still family. I am so happy that this worked out for her. I’m honored to have been involved and to have provided some resources to help. This is one of the most satisfying parts of being a professional genealogist and historian. And also a big shout out of thanks to old City Directories being transcribed and indexed!! My “Peeking into the Past” column and this article originally ran in the Lafayette Square ‘Marquis’, which was published monthly by the Virginia Publishing Company until 2011. It’s always fun to go back and see what I was working on in years past – it inspires me to keep digging too! 1700 Russell: McKinley Heights saloon run by Leonard Bachmann. 2400 Menard: Soulard establishment operated by Robert Zanto and family. 1700 S. 11th: LaSalle canteen run by Anton Filip who resided at 1046 Soulard Ave.
1700 Geyer: Soulard taproom operated by Thomas Hause. 900 Geyer: Soulard pub owned by Bernard Duesterhaus. 2800 Missouri: Benton Park tavern kept by August P. Koebbe. 1800 Park: Lafayette Square lounge managed by John Schnieder. NE corner of Menard/Emmet: Soulard saloon run by Charles Kreichelt who lived nearby at 1019 Emmet. Each Tuesday, I will post a tidbit from my family tree – I hope you enjoy! I love this picture! These cuties are my great aunts – Irene Margaret, Evelyn Maude, Ardis Helen, and Verna Lucille. The picture was taken around 1910 in Minneapolis where their Norwegian immigrant family lived (on 16th avenue) – probably in the Spring as by the 1910 census they had moved to a farm in Mahnomen County. Maybe an Easter portrait as the two youngest are holding bunnies! I would love to find those gold lockets or at least to know that they are kept and preserved by our family. 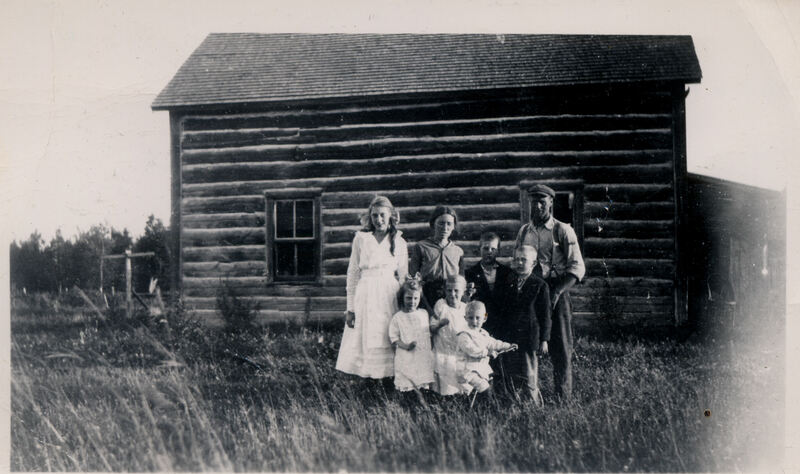 After the Johnsons moved to the farm, four more children (including my grandmother) were born, and the rest is history! There’s been a fun trend twisting on the genealogy blogging sites – visually plotting your ancestor’s birth states or countries. I had to join the fun – here’s mine and my husband’s!! It would be fun to do other things this way – imagine zodiac signs, or how many children in a family, city/country living, etc. Ah statistics!! This article from today’s 1890 St. Louis Post-Dispatch piqued my curiosity – “‘Bob’ Grierson in town again”. This poor man had a story – what was his background that made for such an unfortunate highlight in the daily paper? Robert was the son of Benjamin Grierson, a major general of volunteers who went on to be Superintendent of the General Mounted Recruiting Service in Saint Louis, Missouri from 1873-1874 and later commanded several forts in Texas. (He also had commanded the 10th US Cavalry, one of two units composed of African-American soldiers) The family was originally from Jacksonville Illinois but moved extensively as General Grierson was posted out West. Robert attended medical school and suffered a history of mental illness. He managed the family ranch outside Fort Davis, Texas in the 1880s, and was elected county commissioner. Family investments fell on hard times as drought devastated the local cattle industry. When the county treasurer embezzled $2000, Robert, as the commissioner, was held personally accountable for the loss. That pressure, coupled with the death of his mother in 1888, overwhelmed him and he collapsed into depression. His family eventually had him committed to the Insane Asylum in Jacksonville, Illinois, where they still kept residence. In the 1900, 1910, and 1920 census he was listed a patient at the Illinois Central Hospital for the Insane. He apparently indulged in frequent unscheduled trips to St. Louis during his stay at the asylum – I don’t blame him, I can only imagine how horrible conditions were at a turn-of-the-century insane asylum. He died in 1922 and was buried in Jacksonville, Illinois. I hope you enjoyed this little peek into the past – it’s always fascinating for me to find the back story on a particular situation especially with a local connection! “Benjamin H. Grierson: An Inventory of His Papers, 1827-1941 and Undated, at the Southwest Collection/Special Collections Library.” University of Texas Libraries. Accessed December 8, 2015. “Wooster, Robert. Frontier Crossroads Fort Davis and the West.” College Station: Texas A & M University Press, 2006. Google Books. Accessed December 8, 2015. This is the halfway point in Amy Johnson Crow’s Ancestor’s challenge – it feels good to look back on all of my narratives made public and to know that more is yet to come. Sometimes strange quirks pull me in to my family tree and I turn to investigate a little deeper. Such is the case with my 1st cousine (they were a French-speaking family, so…) 2x removed – Gladys Elizabeth Rancore. She was the eldest child of 16, born in 1899 in northern Minnesota, near the headwaters of the Mississippi River. What got my attention was where she was in 1920. The 1920 census showed her as an inmate at the Salvation Army Rescue Home in St. Paul, MN. St. Paul was about 200 miles away from where she grew up – not unusual for a 19 year old to go looking for a job, and she did die in 1925, so perhaps she was seeking medical treatment. But she came back north to teach in Beltrami County – I found a newspaper clipping from September 1920 saying that Gladys Rancore was teaching at the Winan and Murray schools there. 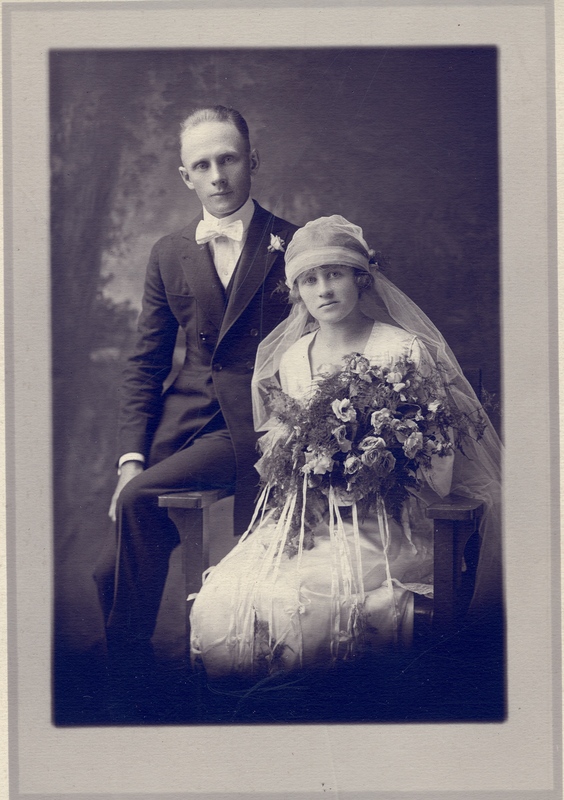 Then she got married in Jun of 1921 to James Lyle Angell . (My new subscription to newspapers.com really has come in handy!) This was marriage #2 for James Angell, as his first wife, Harriet Bogart, had died from childbirth complications in June 1920, leaving 2 daughters. Going back to Gladys in 1920 – I found out that the Salvation Army home in St. Paul was for ‘fallen women’ and had a maternity ward – so it seemed Gladys had a child out of wedlock in January 1920ish. There is no birth certificate that I can find for the child, so we don’t know who the father is, if she would have named him at all. But I suspect perhaps that it is James Angell, for reasons to follow. The relationship between James’ third wife and his children seemed strained – in 1930, his eldest daughter Fern (mother Harriet) was living with her father (perhaps the 13 year old was helping take care of the baby?). Second daughter Florence (mother Harriet) was living with Aunt and Uncle out in faraway Skagit County, Washington. Third daughter Lavurne (mother Gladys) was living in the same community, but with Uncle and Aunt Angell. Given the rapidity with which James Angell remarried after his first two wives died from childbirth complication, it does seem like he was quite popular with the ladies. Could he have had affairs during his marriages? (with Gladys Rancore?) I may be watching too many detective shows and ‘Forensic Files’, but could he have contributed to his first 2 wives deaths, impatiently waiting for another wife to give him a son? 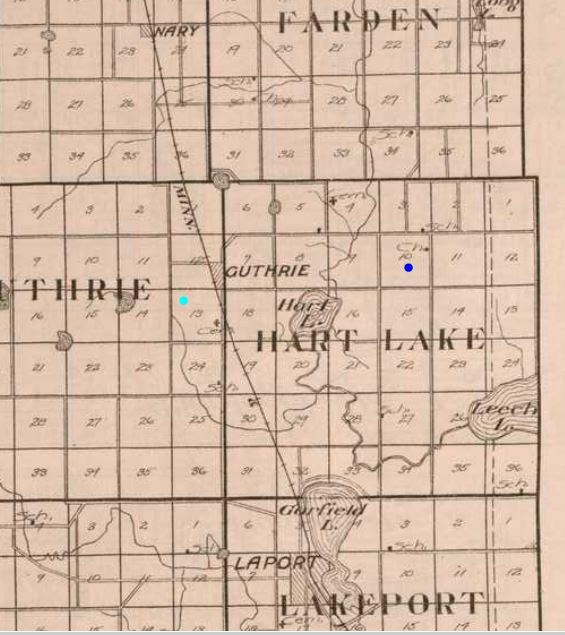 Don’t know the story of the cabin, but my great grandfather moved up to Hubbard County, Minnesota from Webster County, Iowa in 1913 and farmed in Hart Lake Township, section 10. The dark blue dot is Oscar Lindstrom’s and I put the aqua dot as reference to where my mother grew up. 1916 Hubbard Co. plat map, University of MN, John R. Borchert map library. I wish I could find some more information about why they moved from the fertile black gold soil of NW Iowa to the rocky, boggy soil of northern Minnesota. Oscar’s parents both died in 1909 and the heirs sold the 80 acre farm on 12 Jan 1911 for $8270. So that is still a mystery for another day. But it is nice to put that cabin on the map!